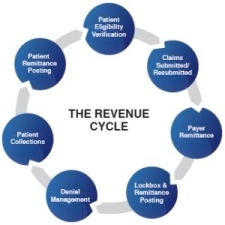 Lean Revenue Cycle improvement eliminates the myriad mistakes in billing processes that lead to payment delays, rejections, and write-offs. Most hospitals and clinics lose enough money in their revenue cycle that if fixed would ease cash flow crunches and fund investments in new revenue streams on advanced patient care services. When you perform a Lean Revenue Cycle transformation you stop paying staff to fix errors and gain the leeway to redirect that effort into providing better value to patients. Improvement teams comprise front line staff from all departments touching the revenue cycle. This enables interdepartmental communication that helps them understand each other’s needs, see the impact of errors, and allows them to work together to redesign their own processes to better serve the whole. When new processes are designed by staff, buy-in is nearly automatic and change far more likely to stick. Reduce AR by $1.9 million dollars. Each of these projects was completed within our 4-5 month improvement cycle and the gains have been maintained since project wrap-up. The money freed-up by the improvement teams has been redirected to creating more patient value and putting the hospitals in better competitive position. Please call or email Jamie Martin — 303-666-6776; jamie@sigmamed-it.com — to talk about your situation, our approach, or to schedule a quick assessment to find the drains on your revenue cycle processes. We guarantee our results and you have nothing to lose.